While having several different web browsers installed is fine, it can become a problem. One of the biggest issues is each browser will have its own set of bookmarks (favorites). If you create or delete a bookmark in one browser, that change will not be reflected in the others. Many modern browsers do have a profile backup and sync option built in, but it’s only available between browsers of the same type. For instance, synced bookmarks in Chrome will only show in Chromium based browsers. Of course, you can manually import or export bookmarks between browsers but it’s an inefficient solution that needs constant updating. This becomes even more difficult if you want to keep your bookmarks the same across different computers and operating systems as well as different browsers. The built-in browser sync will work if you have the same browser on each computer. However, it won’t if you use Chrome on one and Firefox, IE or Safari on another, for example. Here we have five solutions that enable you to have the same bookmarks across different browsers and also different computers. This helps to keep your bookmarks more organized and available whatever computer you are on. Xmarks used to be called Foxmarks and is these days owned by the popular online password manager LastPass. It supports four major browsers; Chrome, Firefox, Internet Explorer and Mac OS X Safari. While that’s not a huge list, it may be enough for your needs. Extra support for mobile devices is found in the paid Premium version. A couple of other Xmarks features are the ability to sync opened browser tabs, show site information and history across your browsers (Firefox only). A useful option when you signup for an Xmarks account is you can use LastPass account details to sign in. If you don’t use LastPass, create a new account through the website or the extension. After logging into the extension via the wizard, Xmarks will offer to merge the bookmarks in your browser with any stored on the server. 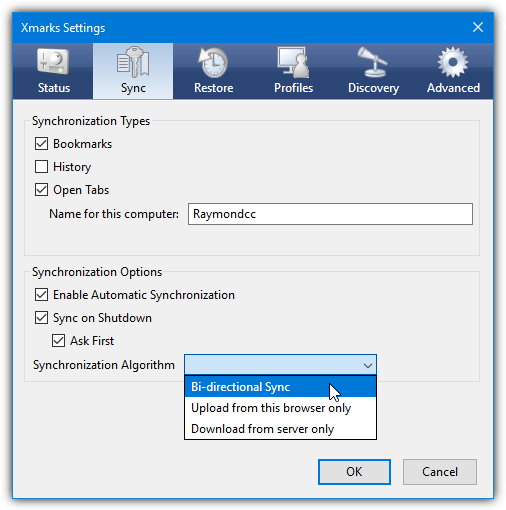 The sync option can be changed to overwrite the current bookmarks from the server and overwrite the bookmarks on the server with those in the browser. From the extension icon, you can manual sync, open the remote tabs window or go to the myXmarks page online. Firefox has extra entries to update favicons and show website info. Inside the extension settings window, you can change the sync settings, change bookmark profiles, alter the encryption level and repair, upload or download bookmarks. Firefox users have additional options to restore previous bookmark sets, enable/disable site info/tags/history or use your own server. The online myXmarks page is viewable in any browser where bookmarks in the library can be added to, deleted or edited. It’s also possible to share bookmarks with other users, remove duplicates, restore old bookmarks, sync profiles, import from Delicious and export to HTML file. 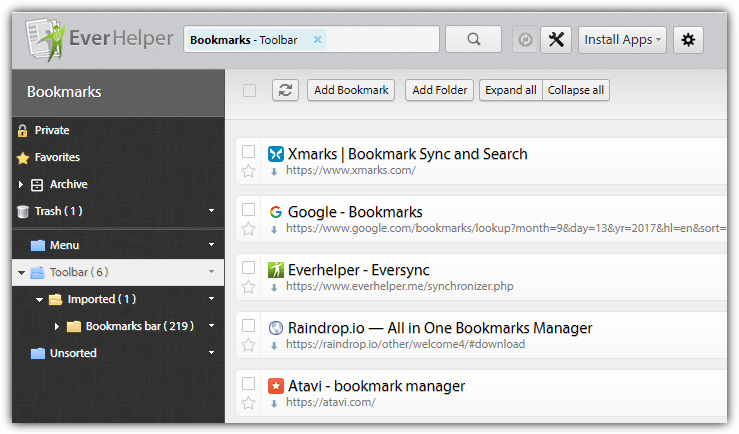 EverSync is a multi-platform bookmark syncing service that works in several different scenarios. You will need to use a browser extension for Chrome, Firefox or Internet Explorer or a smartphone app for Android, iOS or Windows Phone for the service to work. 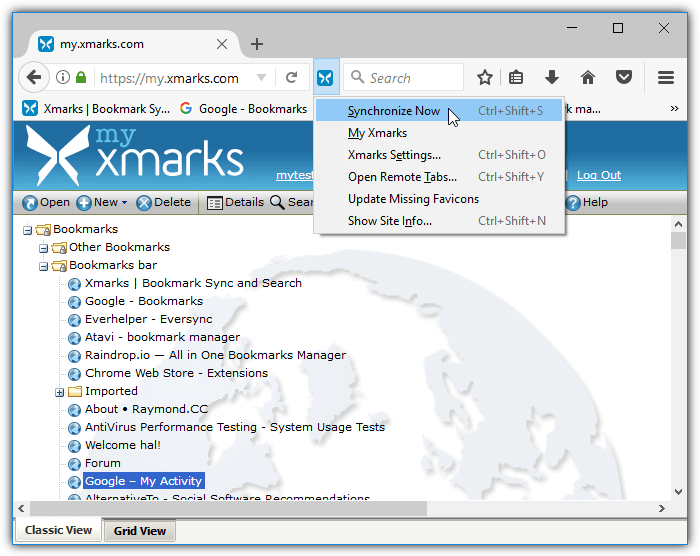 It is still possible to view or edit synced bookmarks in a web page from a non-supported browser like Edge, but they cannot be merged or downloaded into the browser’s own bookmarking system. Go to the EverHelper website and sign up for a free account, then visit the download page to install the appropriate extension or app. The browser extensions look different but behave the same. For the first sync, you have to select the initial action. Either merge the current browser bookmarks with those on the server, overwrite the server bookmarks with those from the browser or download and overwrite the browser bookmarks with the bookmarks on the server. The default option is to sync the bookmarks every 30 minutes although you can manually sync at any time via the extension. Going to your account page shows the bookmarks currently synced where you can manually organize, edit or add new bookmarks. The tools button has some useful options to find duplicate bookmarks, find empty folders or import/export .HTML bookmark files. 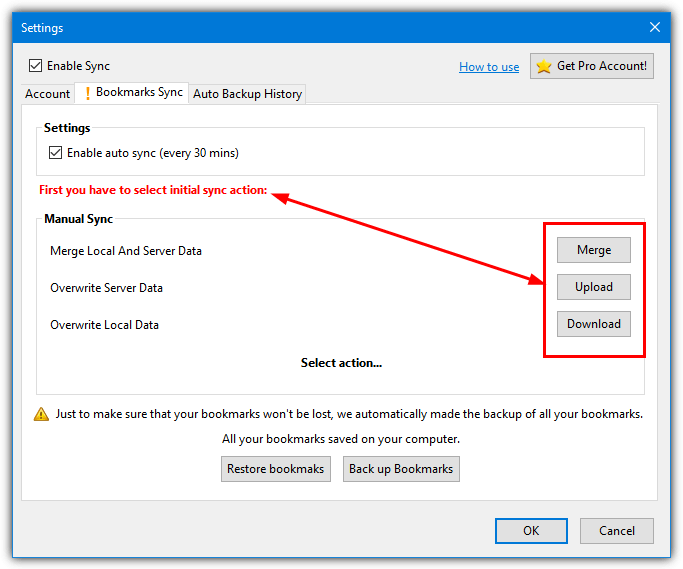 All bookmarks are backed up during certain actions (like initial sync) and can be restored at any time. 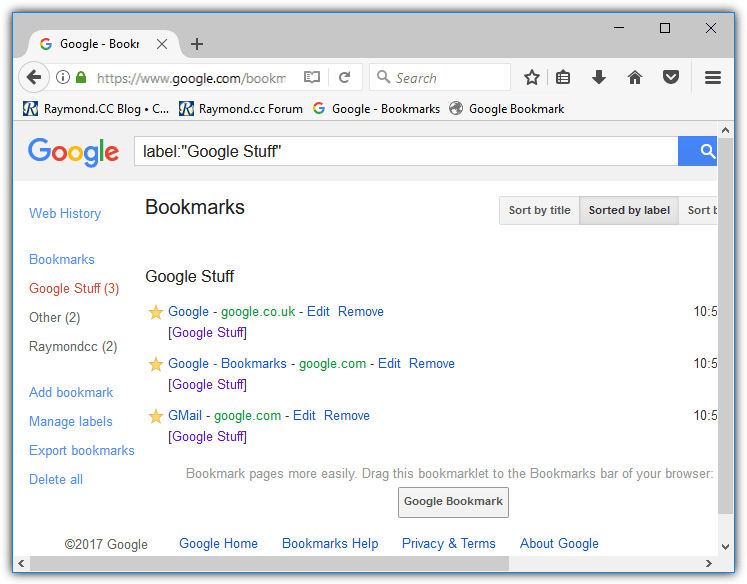 The Google Bookmarks feature is relatively unknown compared to most of Google’s other online services. In fact, it’s been available for over a decade but has never been that well advertised or supported. While it’s a more basic bookmark syncing service than the others here, you are quite likely to already have a Google account so can start using Bookmarks straight away. 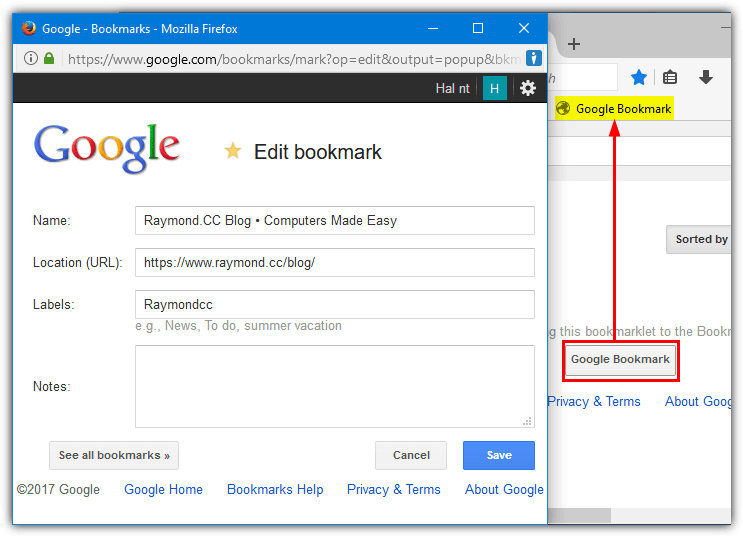 Google Bookmarks is not related to the syncing options in Chrome and is a separate service. After creating or logging into your Google account, simply visit the Google Bookmarks page. There are two ways to add a bookmark; press the “Add bookmark” link on the left or drop the gray “Google Bookmark” bookmarklet onto the browser bookmarks/favorites bar. A window will pop up to enter the name, URL, label, and an optional note. Using the bookmarklet will automatically enter the name and URL for the website in the current browser tab. Click the blue add button when you’re finished. On the page, bookmarks can be sorted by date, label or title while the labels can be selected on the left to show only bookmarks with the same label. 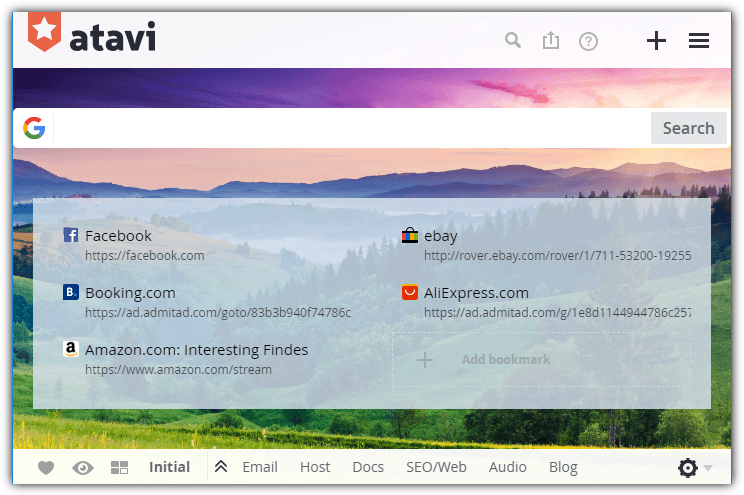 There are a number of Chrome and Firefox extensions to view the bookmarks, add individual entries to Google Bookmarks or sync between server and browser. Google Toolbar for Internet Explorer also uses the same bookmarking system. A drawback with Google Bookmarks is there’s no import option to add several bookmarks at once. A few workarounds include importing Internet Explorer favorites via Google toolbar or using the Fess Firefox extension which has an import/export feature. Oddly, we didn’t come across an extension to import to Google Bookmarks from Chrome. Raindrop is very much like XMarks and EverSync in terms of a full bookmark syncing system. The number of supported browsers and systems here is more impressive with extensions for Chrome, Firefox, Safari and Opera, apps for iOS and Android, and desktop applications for Windows and Mac. 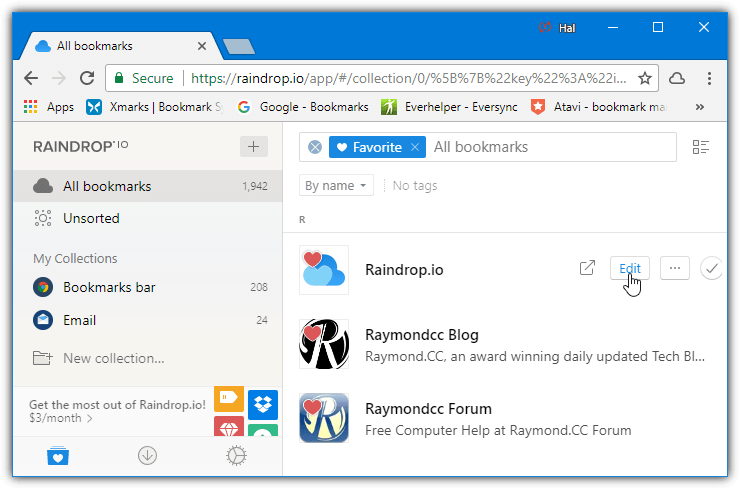 Your personal online page at Raindrop is very similar to what you get in the extensions/apps and can be used if your browser or OS is not supported. You have the opportunity of signing up for a free account either direct from the Raindrop website or after installing the desktop application/browser extension. Only a name, email and password is required. After signing in the option will be available to import bookmarks into Raindrop if you don’t have any already. Pocket and HTML files are supported among others. All the bookmarks will then be available from the extension icon or desktop app. Simply visit a website, click on the extension and press the Add Bookmark button or browse through your current bookmarks and click the entries to visit. The list can be changed visually between text based or image based. 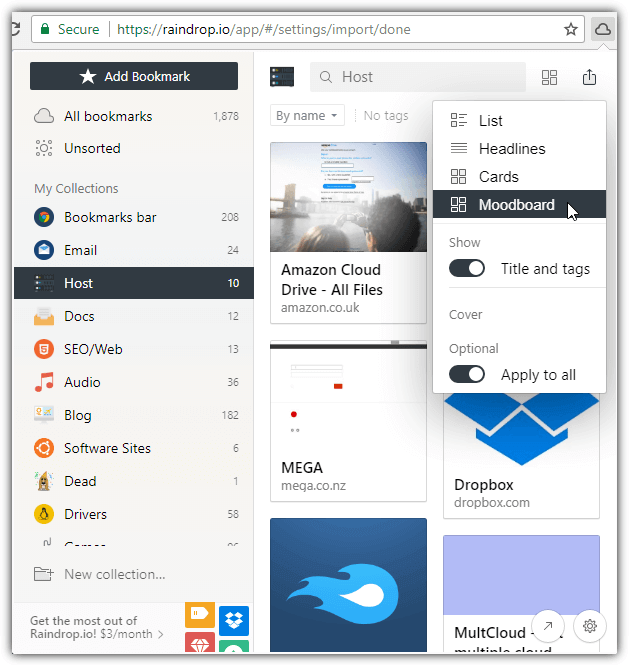 You can also edit each bookmark entry, favorite a bookmark, bookmark images as well as URLs, drag and drop onto the extension window, and share your bookmark collections with others. A paid Pro upgrade is available with extra features like cloud backup. Atavi is a little different to the other services here. It’s mainly because Atavi is not so much a bookmark sync service as opposed to showing your bookmarks on a dedicated start/home page. As this can be used on any system or browser, it has a similar effect to a full syncing service. 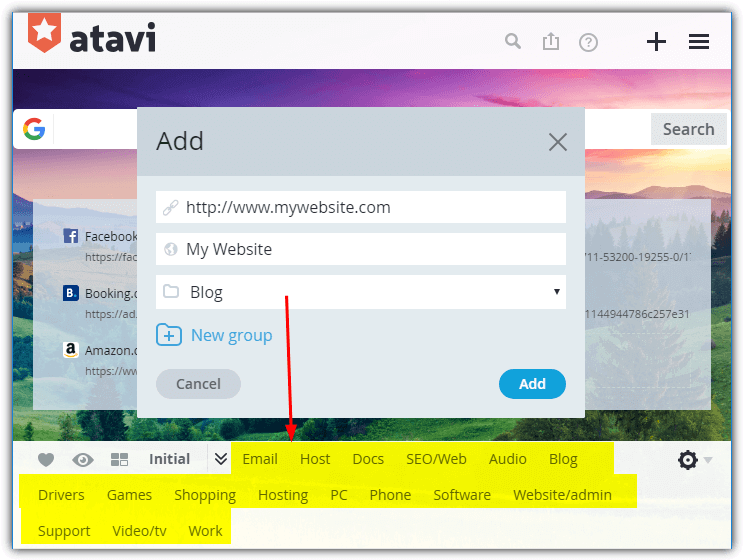 There are many comparable options available that do the same thing, Atavi is useful as it concentrates on bookmarks only which makes it closer to traditional syncing. Firstly, go to the Atavi website and sign up for a free account. Once registered, your page will look like a speed dial from Opera or Vivaldi. To add a bookmark, click the + button and enter the URL, name and optional group. For importing bookmarks from another browser or HTML file, open the menu and click the Import button. You have the option of installing a Chrome, Opera or Firefox extension to help with the import from that particular browser, or just browse for and upload a file. The menu allows changing the bookmarks from thumbnails to text. There are also options to change the search engine in the search bar (Bing, Google, Yahoo or Yandex), sort bookmarks into groups, export bookmarks, install the bookmark manager extension, change the page theme or change the language. While you cannot create folder structures with Atavi, the editable groups showing across the bottom of the window should go some way to help organize your bookmarks more efficiently. I’ve also been looking for a solution. Recently tried Tabs Folders, but I’m not sold yet. They are also dropping Firefox support according to an email I received from support. Any other suggestions? I had tried Xmarks before the shutdown date, last year or previously. It messed up my bookmarks so royally I have never recovered! I am glad they are gone! So no one else has to suffer like I did. I have NEVER RECOVERED from their mess. I am a researcher, a serious researcher, and it really hurts. Others had glowing reviews of them so I went installed it. Stupid me for listening to others!!!! If you are a ‘researcher’ you should know the importance of backing things up before trying. Yeah, I highly suspect you did something wrong. Xmarks was a wonderful product and I miss it a lot. Frankly the need to have synced bookmarks is the only reason I stick with Chrome. I keep wanting to leave for other browsers but the bookmark sync keeps me staying. I wish there was something I could use across browsers and not have to install anything. Hell, just a bunch of links is all I need. Sometimes I’m on different computers where I can’t install anything, so having access to my shortcuts is all I really need. All other major browsers offer the same syncing that Chrome does. I switch between Firefox, Chrome, and Safari on a regular basis and my bookmarks are always kept up-to-date. The one downside is the bookmarks only sync for the corresponding browser. i.e. Chrome syncs Chrome bookmarks and Firefox syncs Firefox bookmarks etc. This is where a bookmark syncing solution across browsers would be nice. Someone on another site raved about papaly.com. I’ve installed it but have yet to give it a good run. You might want to try it. As one of many trying to find a solution with Xmarks shutting down, I tried EverSync, but it doesn’t support IE or Edge, which to me are essential for cross-browser syncing. It has an IE link on the page, but it doesn’t do anything and it looks like it’s many years obsolete (maybe it worked with IE6). For those who don’t know, Windows will do a fine job of keeping IE and Edge in sync, so if you can sync either one of those, you’ve got both. I posted several questions to EverSync/EverHelper/Nimbus asking about the IE sync, but no response. I finally ruled that out. Basically the same experience with Raindrop.IO. I found a few other suggestions, but nothing I found worked like Xmarks. The best option I’ve found is actually RoboForm. It doesn’t actually overwrite the bookmarks/favorites in the browser, so still not as good as Xmarks, but it does give one-click access to its own internal “Bookmarks” tree. On the other hand, better than Xmarks, it fully and natively support Edge and, because it stores the bookmarks in its own tree structure, it seems much less likely to ever get corrupted than Xmarks, which did occasionally corrupt. Using it is about the equivalent of the tree structure you would use if you have more bookmarks than fit in the bar at the top of the screen in all the browsers. So this adds 1 click, but then is almost the same as native bookmark syncing. RoboForm has a very simple bookmark import option from the browser and from an Xmarks bookmark export. It worked flawlessly for me. The limits I’ve found so far with RoboForm, none of which are dealbreakers for me, are that you can’t manually override the alphabetical sorting and you can’t drag and drop bookmarks to move them without opening the Bookmark Edit window. So far, I’m still using LastPass as my password manager, but I may shift to RoboForm for everything (it imports from LastPass too). I originally used LastPass because of Xmarks anyway. Since it’s their fault that Xmarks is going away, I do feel like taking my password business elsewhere and if RoboForm’s bookmarks keep working this well, I’m happy to give them my password business too. Last thing, RoboForm seemed to start me out in a trial. I’m not sure if I need the paid version or could get by with free, but I think it may require the paid version for the cloud syncing, which would be necessary for cross-platform bookmark syncing. But I can’t tell if that’s currently working because it works with the free version or if it’s just because I’m a full-featured 30-day trial. Single user paid version is $19.99. I still can’t find other alternatives of xmarks with the features that xmarks have. I simply want to use the browser bookmark buttons and xmarks like plugin that do the sync between all the browsers as well as on the cloud. I’m searching for a bookmark synch that is compatible with the Palemoon browser. If someone can help me to find an alternative to Xmarks whom is shutting down May 1st, 2018. Because I was trying to fix my XMarks (which has dumped all my bookmarks more than once in the past couple of years) I had to go to the Xmarks website. I had looked for alternatives before but always came back to Xmarks. Now I have no choice but to find something else. So hopefully, I’ll like one of these and it will actually work across all of my browsers. Xmarks will be shutdown on May 1st 2018. LastPass f-up Xmarks with Mozilla’s transition to Firefox Webextensions and never recovered from that mess. It was the best bookmarks sync extension between FF, Chrome and IE. At LastPass, we’ve staked our claim in password management, and providing our community with a high level of password security. After careful consideration and evaluation, we have decided to discontinue the Xmarks service so that we can continue to focus on offering the best possible password vaulting to our community. On behalf of the entire LastPass and Xmarks team, we wanted to thank you for your support over the years. Just got email that Xmarks will be going away as of May 1, 1028. Guess it’s time to uninstall and look at other options. Do any of the others mentioned work for Edge as well? Turns out that XMarks is discontinuing their service. So someone will have to remove them from the list. They say the system will stop May 1st, 2018. Just got this email from LastPass today. On May 1, 2018, we will be shutting down Xmarks. After this date, your bookmarks should remain available in any previously accessed browser, but they will no longer sync and your account will be deactivated. You will also automatically receive a pro-rated refund of any balance remaining on your account. On behalf of the entire LastPass and Xmarks team, we wanted to thank you for your support over the years. If you have any questions about your account or refund, please do not hesitate to reach out to lastpass.com/supportticket.php. Is there anyway to sync Mac Safari bookmarks with Samsung Browser on phone? I Think best one is using iCloud account if have one, or can create. Here I am talking about Windows Desktop PCs, sharing my own addiction of bookmarks sync. I can’t stick with same browser hence need same thing in all browser I use. Currently Internet Explorer, Edge, Chrome & Firefox and Safari in macbook. using iCloud I managed to get samething everywhere. It is simple, install iCloud and select settings for bookmarks sync. This is way better than those add-ons suggested. Do you mean you can keep Safari bookmarks in sync with other browsers by iCloud? I use Safari primarily on Mac but I prefer Samsung browser on my phone so I want to keep them in sync. Hi DX500, I have never used Samsung browser but what I guess, fundamentally it is not possible straightforward but if you use samsung browser extensions for safari or chrome than there is chance or similar way. If you want to know how I did, here is detail. It may seems funny or even crazy idea. Possibly how I did may give you some hints. I use safari in Mac and my iPhone. I have iCloud installed in Windows 10 PC, which I use for my heavy duty work. I dont use Interent Explorer but use Edge for some works. so I use gpedit.msc to config syncronize bookmarks between IE and Edge. I am using it for couple months without any issues. Wow. Xmarks is now terrible! I have used it for years with nary an issue; it worked silently and flawlessly in the background. But that all changed with FF Quantum (version 57) and how it implemented extensions. Xmarks was slow to update and when it did, the service was hit or miss. Yesterday was the final straw with all of my bookmarks being quadrupled across all my browsers (that’s when I wasn’t nagged with Xmarks login error screens). I finally uninstalled Xmarks. In case anyone didn’t realize – LastPass just announced that Xmarks is going away a/o 01 May 2018. So, don’t bother – even though I’ve had limited issues with it (just with FireFox), it worked pretty well for me. Now, onward to a new sync tool! Lastpass took over Xmarks some time ago, and have only been maintaining it, not improving it. As of May 1, 2018, Lastpass is dropping Xmarks completely. So…pick something else. XMarks is absolute broken beyond repair across all browsers. Use it and you will lose a random number of your long cherished bookmarks. Use XMarks at your own risk. DEFINITELY back up your bookmarks before trying XMarks of you are tempted. Prepare for disappointment. Xmarks is now essentially broken. And the company is unresponsive; it’s as if they don’t exist anymore. Yes…VERY true…I’m endlessly having to restore and re-jig. Its hopeless now…It used too be very good and seamless! I use Xmarks and I just received an email that they will cease all operation on May 1. Am so sorry to see them go as i have used them for years. Will now have to use sync with Firefox. I store all my bookmarks on a private cloud based start page start.me. This way I do not have to sync my bookmarks. I rate XMARKS. I’ve been using it for a long time now, since before it nearly folded. (horrors!). Great & simple for updating across the computers I use. Good range of settings. I also find the immediate synchronization useful. I’ve been using Webmarks now since when XP first came out. Its offline database though however I always preferred the layout and look of it. It might not even be available for download anymore since its an old product. Great, now the bookmarks are fixed. You see, I have 5 different firefoxes and 5 different palemoons even my SRWare Iron has a scrapbook plugin which I will ignore for the moment, but the heart of the matter is the giant scrapbook data directories of each of these firefox/palemoons, and to make it more tricky any solution needs to take in consideration that both a firefox and palemoon can run at the same time and therefore “lock” their default data directory and in the end we want to have a backup of all data in one spot which is now up in the Gigabyte range of size. The situation is basically like this because I frankly haven’t come up with a solution yet. This is also a mixed bag of installed and portable so there are files all over the drive. It’s possible to grind them all down into one but takes hours and a lot of paying attention to the source and destination, and it’s probably fragmenting the hell out of the disks while all that goes on. If it was a straight copy operation it wouldn’t get 50MB / sec (like a 1Gig movie file) because of all the thousands of piddly little files, it grinds it down the disk speed to a couple k/ sec . Clearly time is also a consideration which is tied to technique. Something is wrong when it takes you all night to merge import export databases while falling asleep on the keyboard playing sol. I don’t mind an hour, maybe two hours. But to have it drone on hours and hours and then at the end has a list of stuff that didn’t make it isn’t my idea of confidence nor efficiency. If you got a solution do share. Any site to share and save bookmarks online, please ? I’m looking for to save and to share my bookmarks online. Which site do you recommend ? yeah, same here xmarks, for what the last 3 years ? I’ve been using XMARKS to do this, and more, for years?